A methodology is presented for the estimation of the annual spatial distribution of solid precipitation using GRACE (Gravity Recovery and Climate Experiment) satellite data. The data are provided in the grid cells of 1° (latitude and longitude) and allow calculating the water thickness changes near the Earth’s surface including the snow cover water. The GRACE-based difference in water equivalent between the beginning and end of winter was found to be caused by both snow water and land surface characteristics which control the groundwater movement. The regularities revealed for the analyzed region and spatial detailing enable the construction of annual raster low- and mediumresolution (1° and 90 m, respectively) images of solid precipitation. Russian Text © I.V. 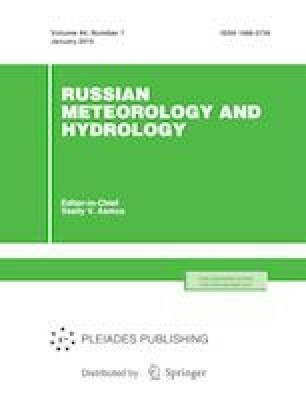 Danilova, A.A. Onuchin, 2019, published in Meteorologiya i Gidrologiya, 2019, No. 1, pp. 103–112.